May | 2012 | Frank & Donnis Travel Blog "the more we see the more there is to see"
Today was umm err, a rest day. Resting from what I hear you say. For the first time in such a long time we have a house as a home base and we just finally relaxed. Nothing was planned. We just mooched around the house and attended to the needs of the two dogs. Well, one dog is happy just to have a pat on the head a few times a day. The other, a black poodle is blind and deaf and I suspect, losing its sense of smell. It requires medication and taking outside to do its business. Other than that we read or watched TV. Boring as it may seem, today was another rest day. Well, at least I rested. 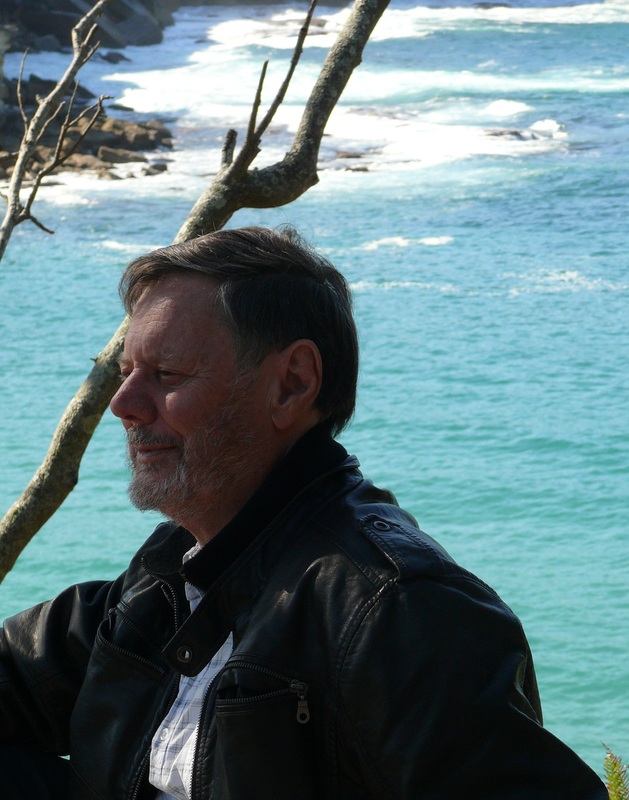 The CO-PILOT drove to Corrimal to help Errol with some work on the, as yet, incomplete house. It is a good thing the CO-PILOT is not the navigator. She got lost going to and coming home from Corrimal. Boring as it may seem…Hmmm. That’s the way I started the comments yesterday. Today was like yesterday. CO-PILOT got lost going to and coming from Corrimal. I pumped up the tyres on the rusting mountain bike. I know which parts are aluminium. These are the parts not covered in rust. I took the trusty rusty treadly for a spin and came home with aching calves and buttocks. 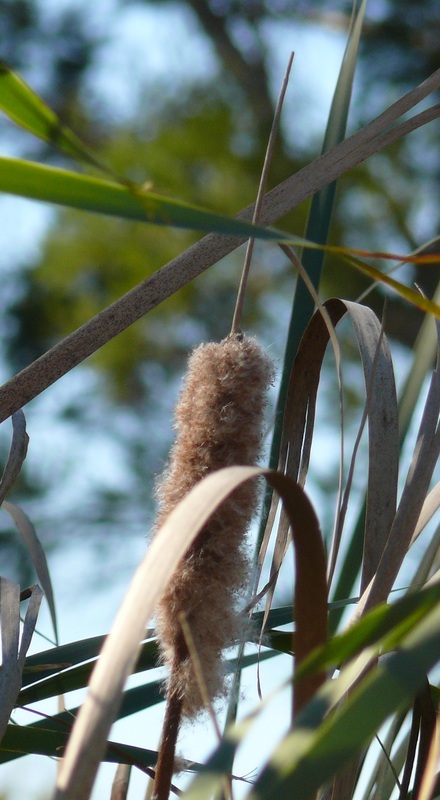 I also walked to a nearby bulrush pond and took photos. One of a number of bulrush encrusted ponds, part of Robin Creek scattered throught the estate. 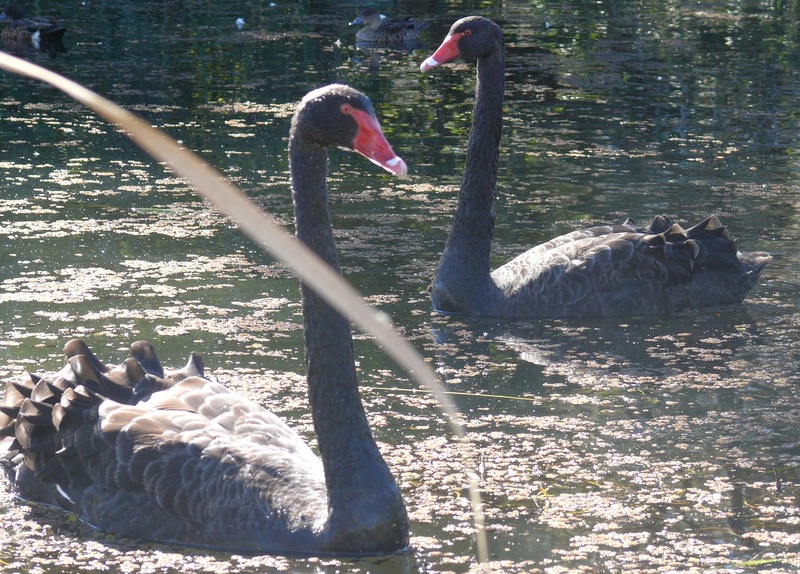 A pair of near friendly swans on the pond. When I approached the pond they approached me but kept a respectable distance. Perhaps they used to being fed by residents? We watched the first round of the 2012 State of Origin game which was won by Queensland with the obligatory controversial try. Visited an Over 55’s Resort in Kanahooka. This one is a relocatable home type resort with most of the homes close to 20 years old. We saw two homes which might be suitable for our needs when the time comes and gave the resort our tick of approval. We then drove on to a gated community with a communal pool, community hall and lake. An open to the public restaurant also operates from beside the lake. We had coffee and scones. 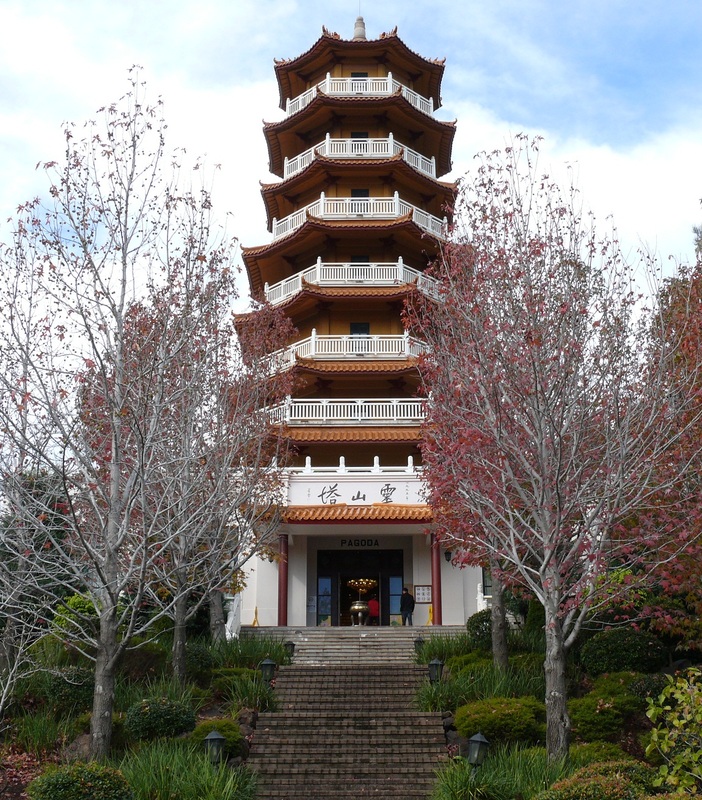 Then we drove on to the Nan Tien Buddhist Temple and Pagoda. The pagoda. This is the building most visible from the Southern Freeway. For those people who have ever driven on the freeway through Wollongong and all points south they can see the temple standing out as a landmark near Unanderra. From any point of view this is an impressive sight. On arrival we discovered there are more buildings than just the temple and pagoda. 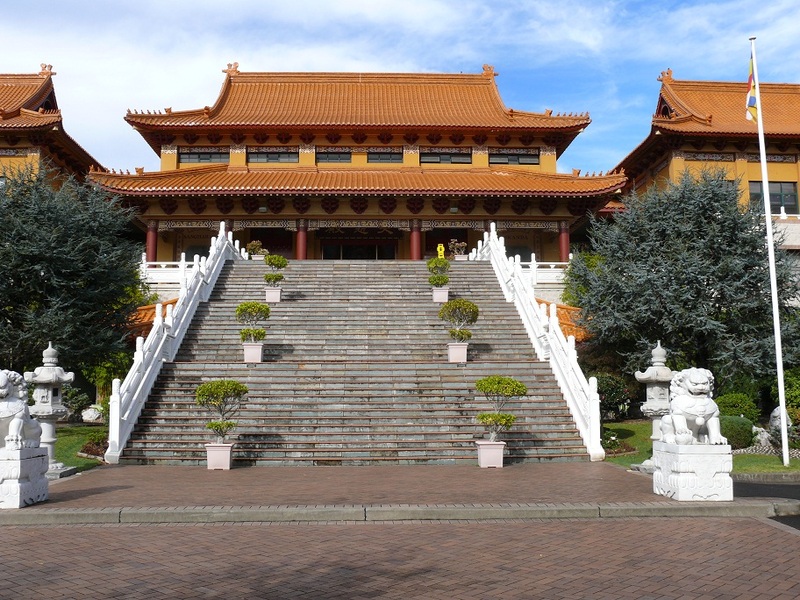 There are several temples with related buildings and squares. The gardens are a delight and worth a visit for them alone. 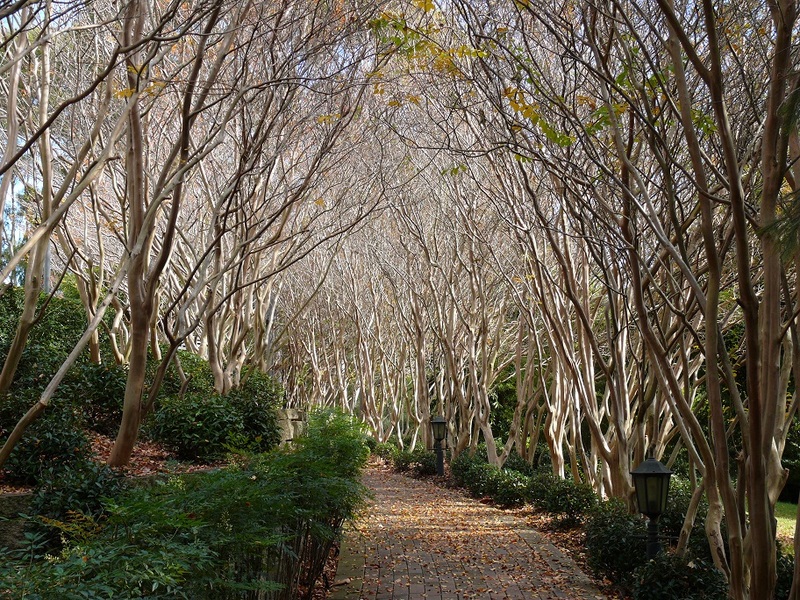 This curving pathway is flanked by winter naked trees, their discarded leaves pepper the path and created a relaxing scene. Entry is free. 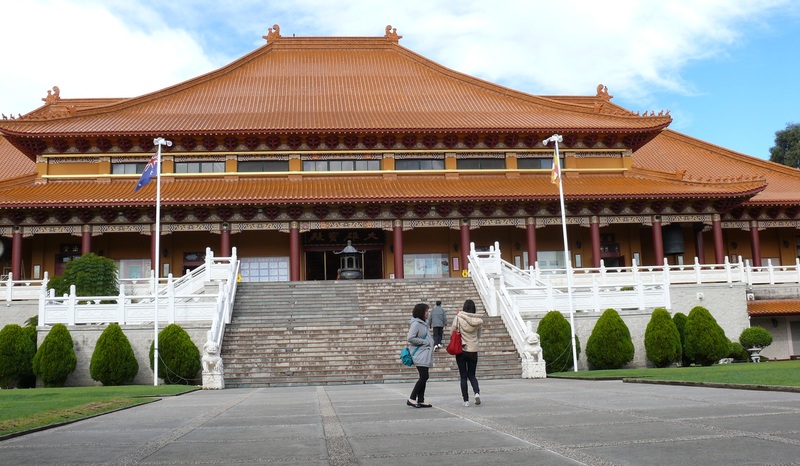 The car park is built on several levels within the gardens and we were surprised at the number of tourist buses and people taking guided tours or worshipping. From the carpark and gardens we found the first temple and were impressed by its size. 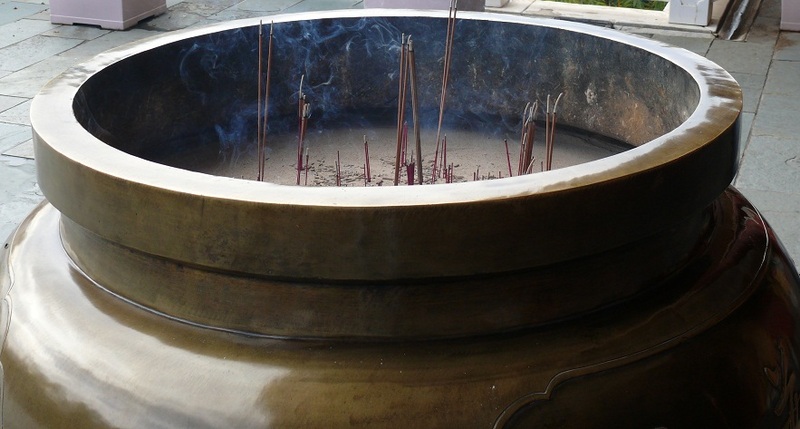 At the top of the stairs and entrance to the first temple is this incense burning bowl. Doorway to temple. From here photos are not allowed and footwear is to be removed. The Buddhist faith is built on many achievable qualities. Some, such as Peace, Harmony, Tranquility are evident here and I found the temples and surrounding gardens had a calming effect on me. There is a restaurant on site serving vegetarian dishes for $12 the smells were enticing. Next time. We found the first temple we encountered was a smaller version of the main temple and square. 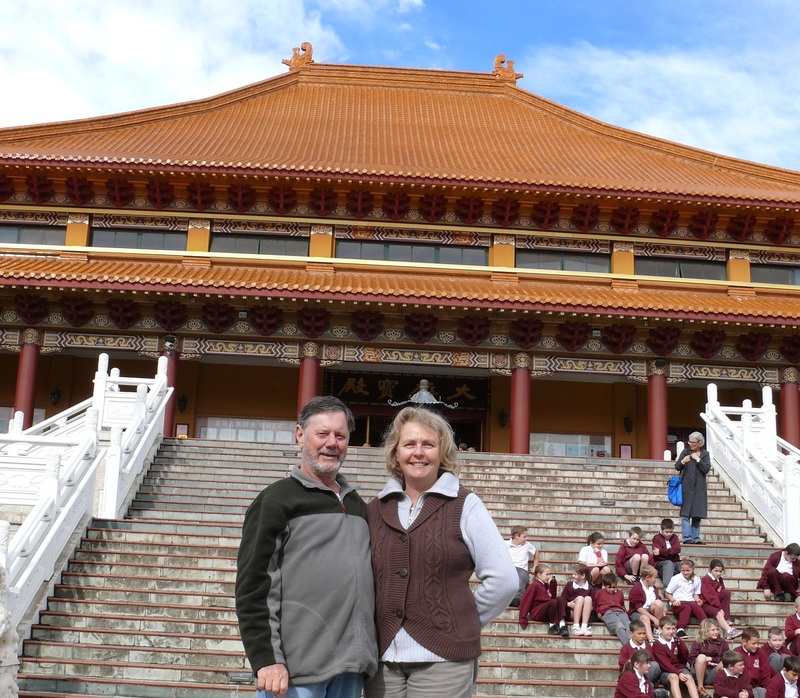 A Korean visitor asked us to take her photo and in return offered to photograph us on the square at the foot of the stairs leading to the main temple. 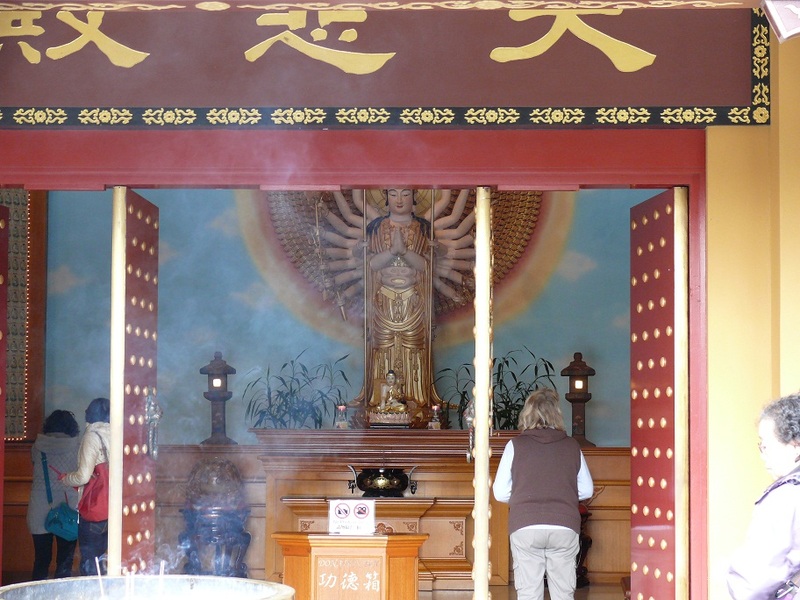 Signs at the entrance to the park asks that the buildings and customs and beliefs be treated with respect. Some buildings ask that you remove your shoes, dress modestly and no photos or videos. Of course all foodstuffs, especially meat, fish, pork and alchohol are not permitted. 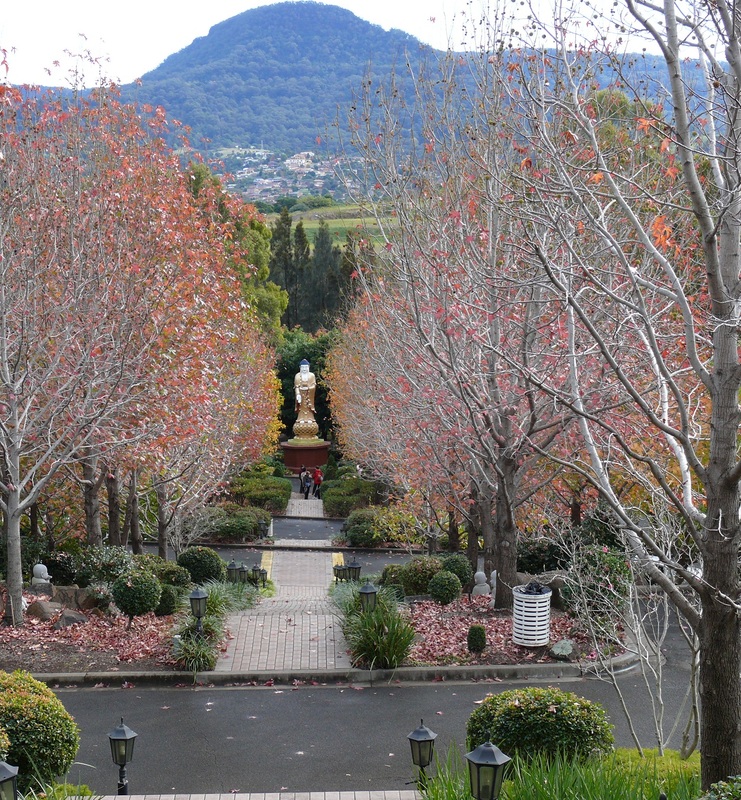 The path and steps pass through a mix of roadway, carpark and gardens leading to a statue of Buddha. (No we did not indulge). If you like chocolate this is the place to let your hair down. Everything on the menu is chocolate and people were queued up to wait for a table. I saw a woman served a chocolate burger. Imagine two giant chocolate chip cookies with a huge chocolate ice cream patty surrounded by a wall of whipped cream. With knife fork and spoon in hand and a sparkle in her eyes she was in chocolate heaven. The CO-PILOT is on a diet otherwise she would have been in the queue. Where possible we try to get out and about so the CO-PILOT can learn about and see more of the Illawarra district. Today was very strong winds and very chilly. In fact when I went for my walk at 6am, walking into the wind was a fight for every step. When I turned around I was blown along the footpath. These westerly winds will persist, off and on, during the next four months. 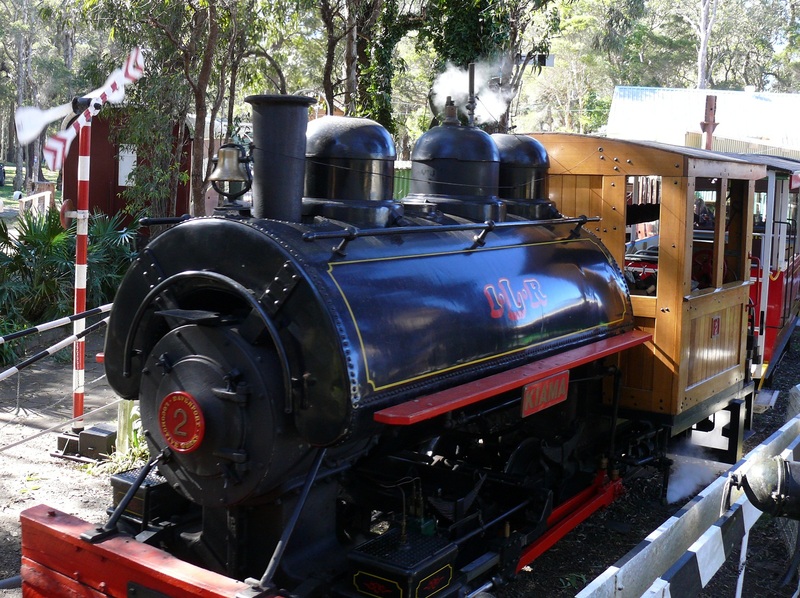 One of several Illawarra Light Rail engines still operational at the museum. (free entry) and watch the camp oven cooking competition. 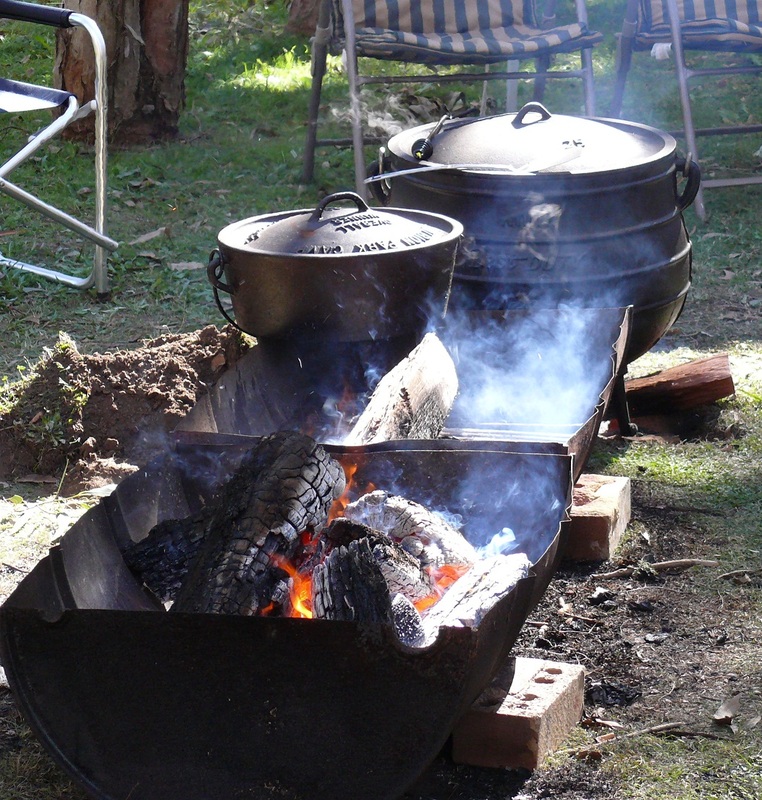 A beef stew was bubbling away in the smaller camp oven but we were not able to discover what was in the large pot. Smelled good though. We probably arrived before the crowds and were only able to watch the heats of a boil a billy of water competition. 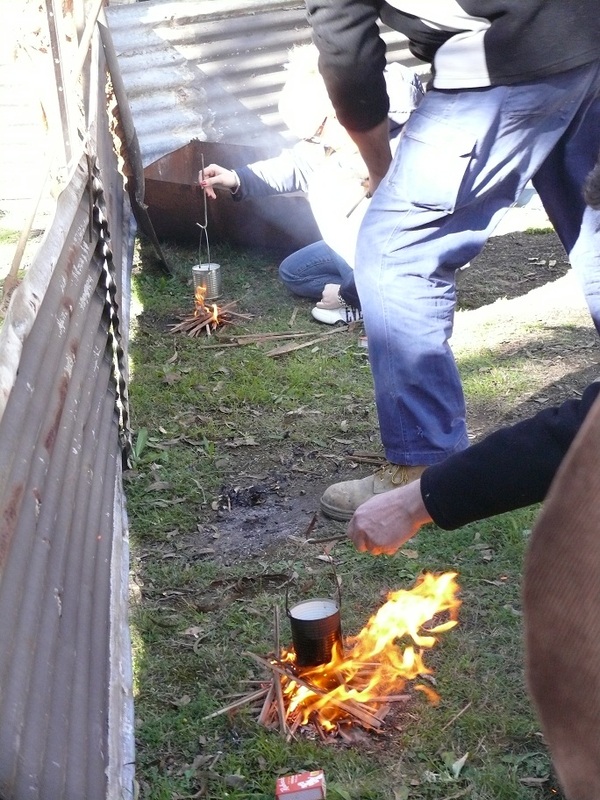 There were six heats of six contestants each having to create a fire from supplied kindling and boil a cup of water in a tin billy. Each heat winner went into the final of six contestants all vieing for a good looking trophy. 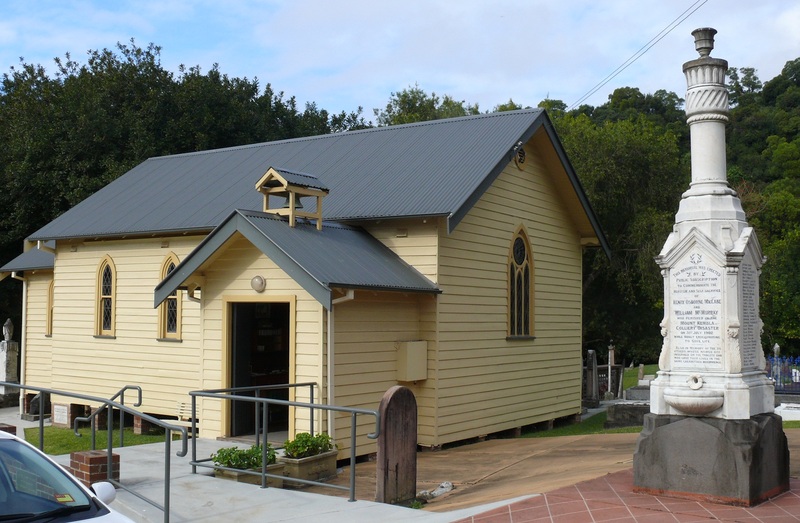 St. Stevens Presbyterian Church stands as a landmark at the entrance to Jamberoo. 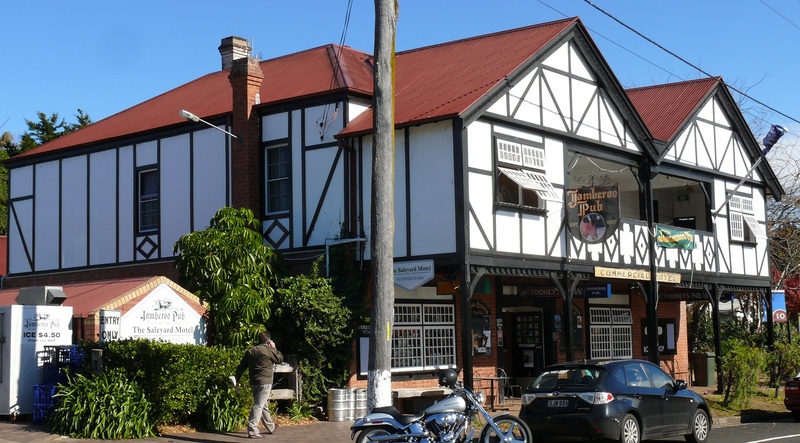 The popular old Jamberoo Pub. Today we visited Hill 60 in the Port Kembla area. 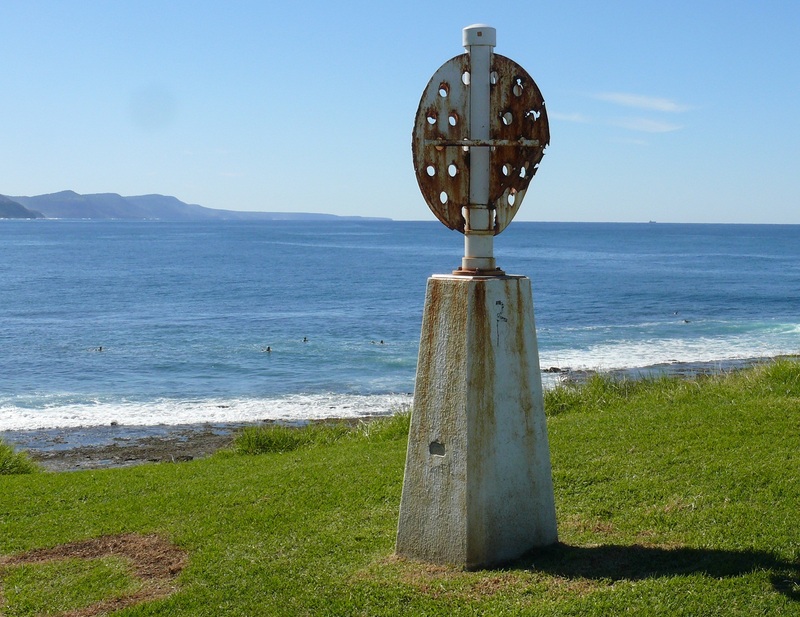 I love these old trig points found in high locations all around Australia. Used as a navaigational aide they are no longer used but most have been retained in situ. 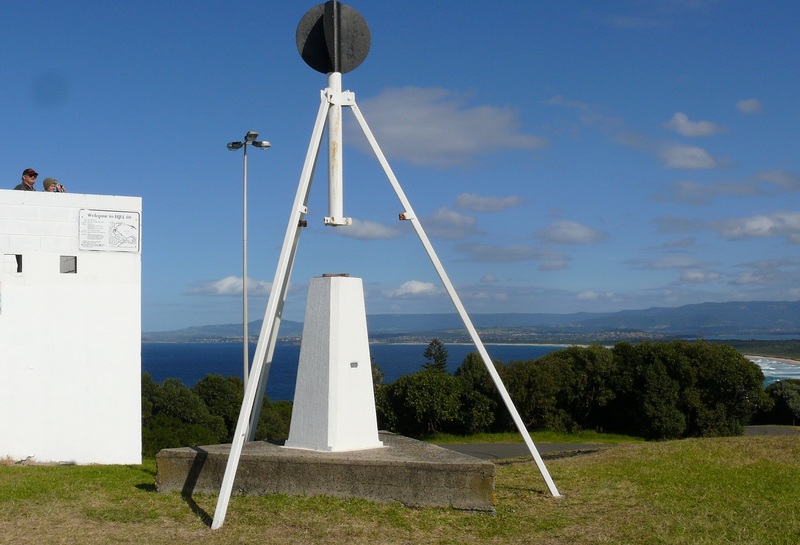 This one is on the top of Hill 60 Port kembla. This is a composite image from 6 photos. It is best viewed by double clicking for a full page image. Looking north twoards Wollongong and to the east. Another composite photo looking south and west. part of the Great Dividing Range are spectacular. Hang gliders use the area as a launch site and although considered today to be ideal conditions there were no gliders to be seen. As well a great left hand reef break below the hill and not a surfer to be seen. A number of people were enjoying a picnic on the grass. Port Kembla is famous for the steelworks. In the afternoon Nicole and Merrilyn visited with the childre so I put the bread-maker to good use and baked a chocolate mud cake. I will set the timer tonight so I wake to a freshly baked sourdough rye loaf. Another one of those days where we seemed to do very little but on reflection we did plenty. Then again, maybe it was a day where we did lots and it felt like we did nothing!! I had a double blood and urine test this morning. I had to fast, again. Then a blood sample was taken after which I had to drink an exceedingly sugary drink and sit still for 2 hours. Oh No. I could not go to the shops or get a haircut. I had to sit still the entire 2 hours. This was so they can measure how my body copes with high sugar levels and eliminates them or stores it. Any activity will help burn off the sugar and distort the natural “at rest” process. She had some of her works on display in glass cabinets. Some of her creations are featured in New York. There is a whole new world of interesting things for us to see and learn about. Quilling has become one of them. Then we saw the Chinese Restaurant across the street with a lunch time special. $6.80 to choose from a special menu including a drink or soup. We chose soup. The meal when it arrived was far from what I expected. I expected an entre’ size Mongolian Lamb with a spoonful of rice. What I got was a huge full meal with a complete full serve of rice. I could not eat it all. $6.80 for lunch, including rice and soup is a fabulous deal. McDonalds eat your heart out. 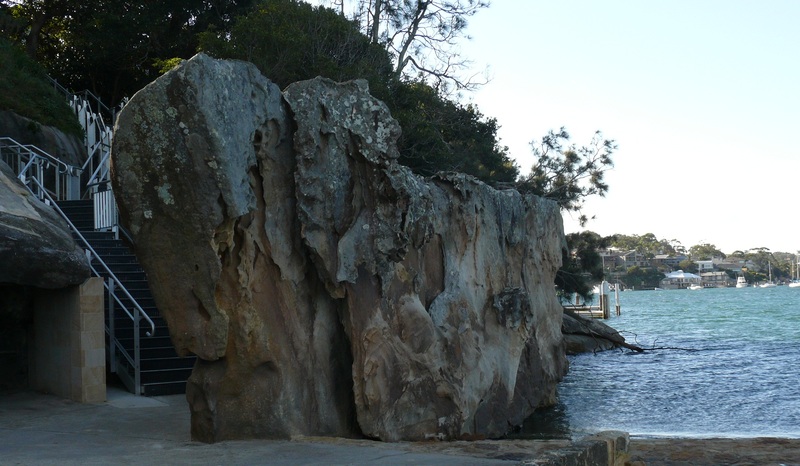 After lunch we drove to a place called Shiprock Reserve at Port Hacking. Council has just built a state of the art staircase down the cliff to the rocks below. A huge packet of money was spent building this impressive staircase to Shiprock Reserve at the base of the cliffs. The reserve is popular with scuba diving fraternity. Council must have spent around a quarter of a million dollars on this project, perhaps more. The entrance has two gate posts faced with dressed sandstone. Cutting and dressing sandstone is an expensive process and the gate posts are both works of art. It seems Sutherland Shire Council must be overly flush with funds. 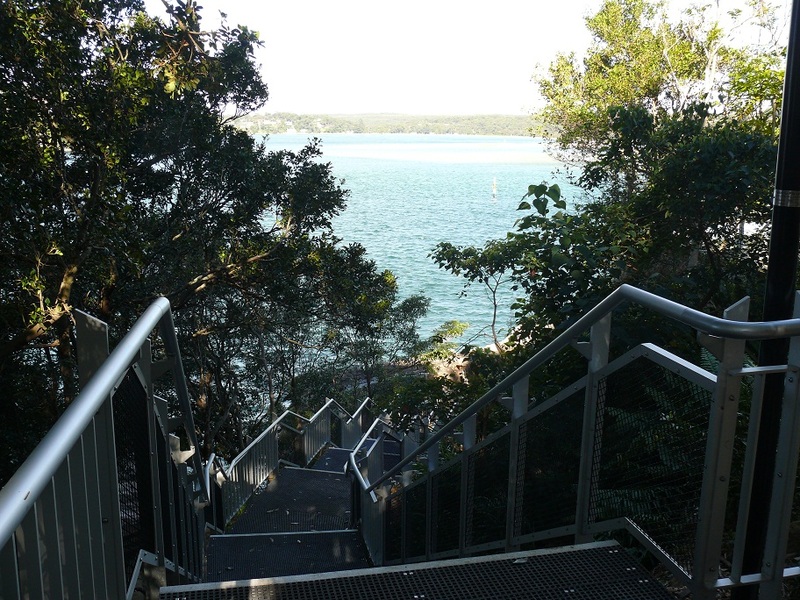 Two observation platforms give an expansive view across to Bundeena. The rock is a popular spot for scuba divers and scuba training. The rock does look like a shape of a ship. The Shiprock Reserve gets its name from this rock which is shaped lik an umm err Ship! Otherwise there is nothing else to see. Small tender stored behind Shiprock. Today was cold and very windy so we did not stay long. We noticed surf rolling in the shallows and sandbank near the Bundeena side of the bay. The strong wind over the last three days has created huge swells and these swells race through the heads finally breaking as surf on the sandbar at low tide. Small surf in Port Hacking. I recall many years ago when as a “go anywhere for a surf” youth my friend Laurie Otto and I paddled our boards from the Cronulla end of Gunamatta Bay just to surf this sandbar. The thought of sharks never entered our heads. After exhausting hours of surf we then had to paddle all the way back to Cronulla. I was pleased just to be able to see this surf again and stand mesmerised. A local ferry passed close by and I recalled the ferry’s operating at the same time as we surfed all those years ago. 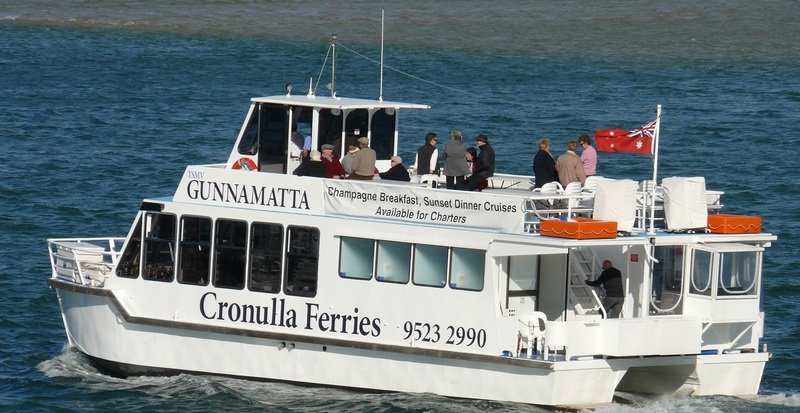 Cronulla Ferry Service on Port Hacking. After that we went to Miranda Fair to shop for dinner tonight, our last night before we take up a three month housesitting gig in Horsley starting tomorrow. You be the judge. Was it a day where we did little or did a lot? Last night we received a call to say the houseowners want to delay leaving by another day. We took the opportunity to visit the Royal National Park. First we drove to the river crossing at Audley where we saw the historic old boatshed. Historic boat hire shed at Audley. Maybe my memory is imperfect but it really does not look much different to when I was a youngster or when I last visited in my early 20’s. Next on our list was a visit to Wattamolla Beach where we had an opportunity to leave our footprints on fresh wave washed sand. On the cliffs above the beach at Wattamolla. Once again this spot looks unchanged since I last visited, probably in 1969 or thereabouts. 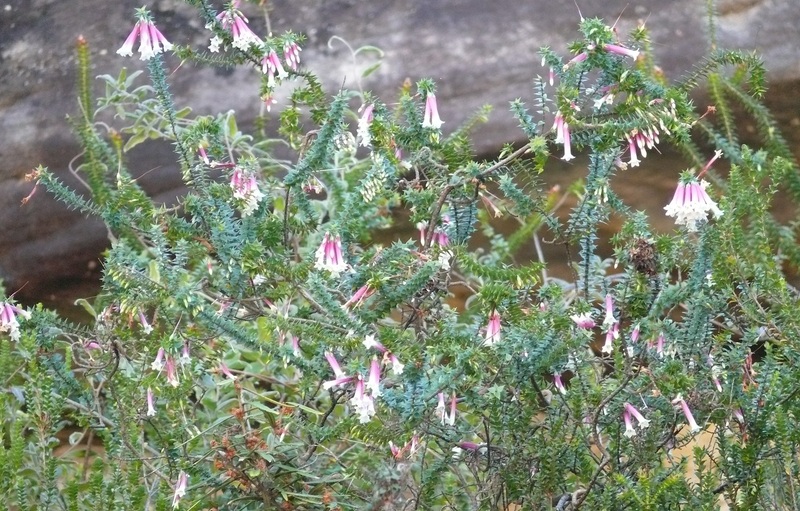 Many coastal heath type wildflowers were in bloom throughout the park. This is one of them. The car-park is sealed and a walkway to the beach is in place but otherwise not much has changed. It is a picturesque spot which is loved to death on weekends and public holidays. 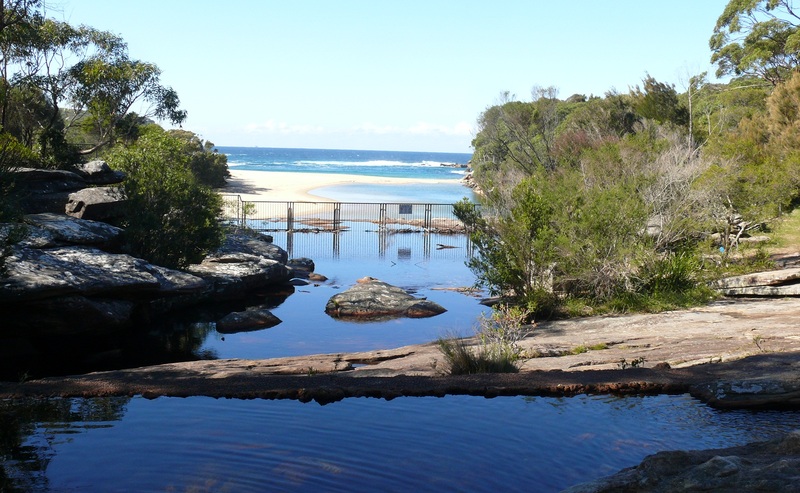 The track still follows the course of Wattamolla Creek and meanders to the creek edge and up again following the sandstone cliff-line, trees, shrubs and overhanging sandstone caves. 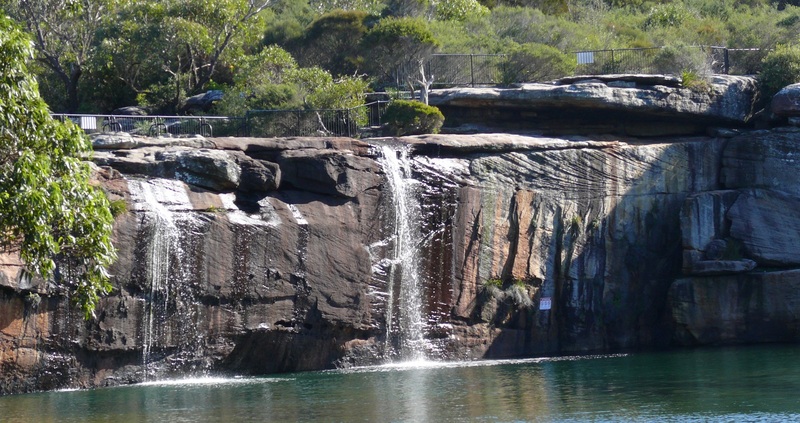 Wattamolla Falls. These falls were featured in a dramatic scene from an earlier episode of Packed to the Rafters TV series. Elder brother Ben was shown to dive from the top of the falls. I have jumped from here when I was much younger. Fences and signs are there to stop the exhillarating diving and jumping from the falls. The path is a mix of sandstone rocks, tree roots, clay and boardwalk. 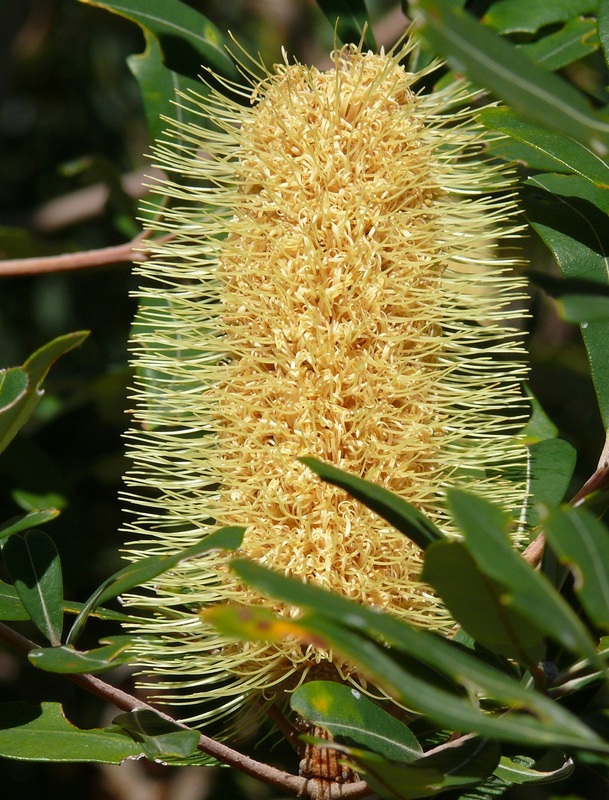 Beautiful coasta Banksia are plentiful throughout the park. There are several great coastal walks of just a few Klms and up to 13 Klms. Hmmm! I would not mind doing one or two of the walks. Perhaps later this year? Next up was Garie Beach. Garie Beach and surf fisherpeople. This place has changed in that the steep and winding road is now sealed all the way to the beach and a huge car-park is also sealed. Three very large buildings are used by the Garie Beach Boardriders Association. Impressive. Impressive also were all the beach fisher people and judging by the catch of what looked like Tailor being carried off the beach, good catches were made. 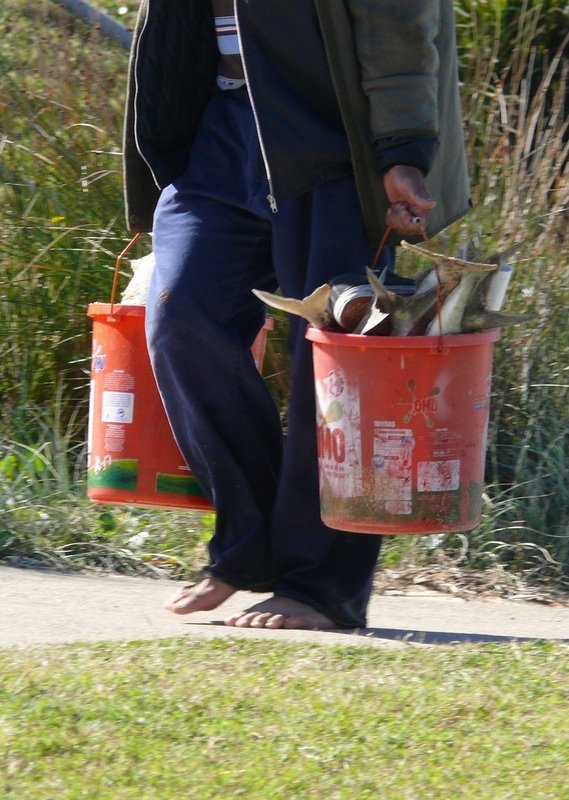 The daily bag limit is 20 Tailor we saw several people struggling to carry their catch to their cars. Tailor? Salmon? Kingfish? Perhaps an observant reader can indentify them? 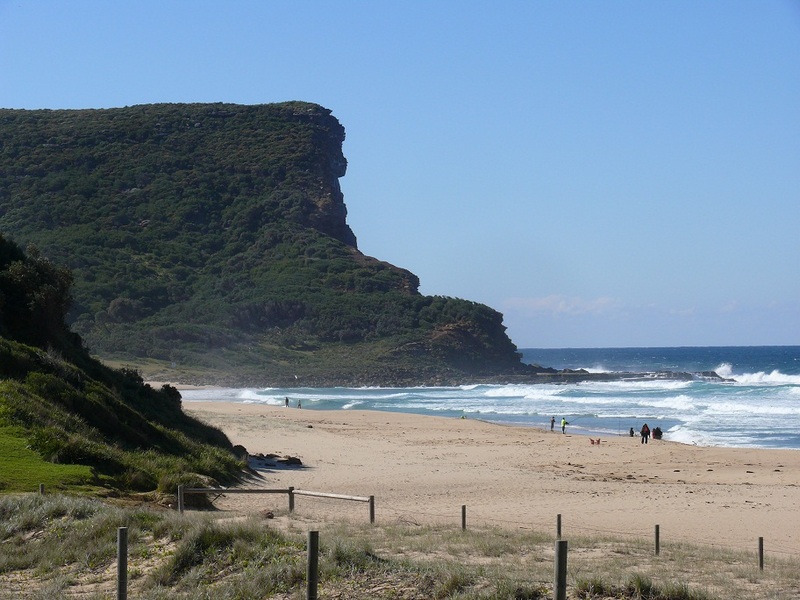 We drove from Gymea to Horsley a suburb of Wollongong where we will take up housesitting duties along with babysitting two elderly dogs. Greg and Anne O welcomed us with a barbecue dinner and gave us a guided tour around the house. Their son Adam and his partner Katie arrived to round out the numbers for dinner. We all relaxed and it felt like we had been friends for many years. Tomorrow begins day one of three months of house and dog sitting. Greg and Anne had planned to leave by 8.30. Like us their getting away plans fall awry and they finally got away after 11am. At 12.30, as we were eating lunch we received a call. They had forgotten a few items and were on their way back. Oh dear such a long way to drive…twice. Late in the evening we received a text to say they had arrived just outside the town of Orange and were set for the night. We had a barbecue with Errol n Nicole and returned to Horsley to settle down for our first night alone with the dogs. Regardless of their pest status it was still fun to see them. A female deer. If you enlarge the photo you can see the little deer almost hidden in the grass to the right of the mum. I bought a bread maker a couple of weeks ago and today was our first chance to use it. The first test was to make a butter cake. The result was surprisingly good although I failed to notice the browning setting which created a base crust. A lighter browning will produce a nice light but moist cake with a regular base. Tomorrow I tackle making a Sourdough Rye Bread. Most of today was spent just vegging out. Errol called in for morning coffee, in time to taste test the cake. Another of those days when we seemed to do nothing. In the morning I did test number two of the bread-maker with a Sourdough Rye loaf. After we attended to the two dogs needs we drove over to Shellharbour Square Shopping Centre for some retail therapy. Hmmm! Not much relaxation therapy in such a stressful environment. This is without a doubt the biggest, busiest, noisiest, crowded, complicated shopping centre we have encountered. We were both happy to get out of there. Noteworthy is that all levels of the car-park have great views across Lake Illawarra and on to the Illawarra Escarpment. Back home the aroma of fresh baked bread greeted us as we entered the house. It may not have been the best sourdough rye but I sure enjoyed the crusty rye taste. A bit of roast chicken and lettuce made for an enjoyable sandwich. In the afternoon we drove to Kanahooka to have a look at a lifestyle resort. Hmmm! It is a combination of lifestyle resort plus a care facility plus a high care facility. It all seemed old, musty and as Donnis noted, it was all too much like going to work. Neither of us could live in such a facility. Strike this type of resort from our list. 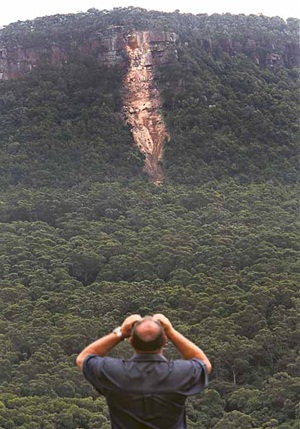 The latest landslide at Mt Keira on the Illawarra Escarpment. A good reason not to build below sheer rock cliffs. I have seen these landslides before at the escarpment behind Dapto. I rode a trail bike to the bottom of the slide and found rocks bigger than houses, in fact a house was nearby and had it been further up the slope would have been wiped out. The scar from that landslide is still visible…if you know what and where you are looking. In the morning we went for a drive to Kembla Grange and had a look at the Go kart Racing. The track and pit area is huge as you would expect in such a large population area. The grounds and track are nowhere as good as those we experienced in Mackay late last year. So for our readers Shan and Dave please tell the Mackay Go Kart Association to take a bow. 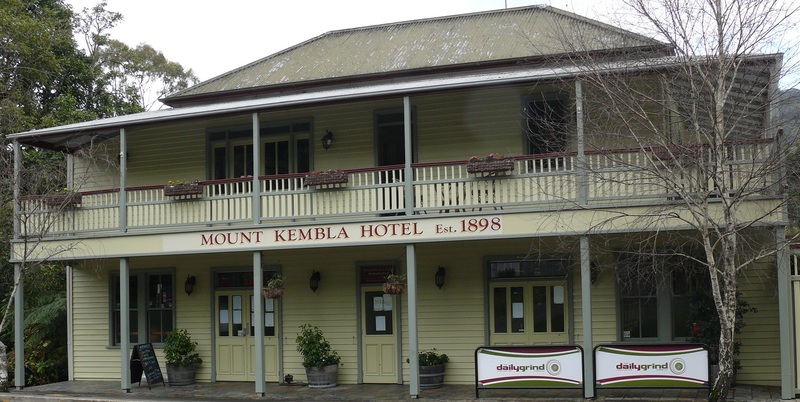 Mt Kembla Hotel. 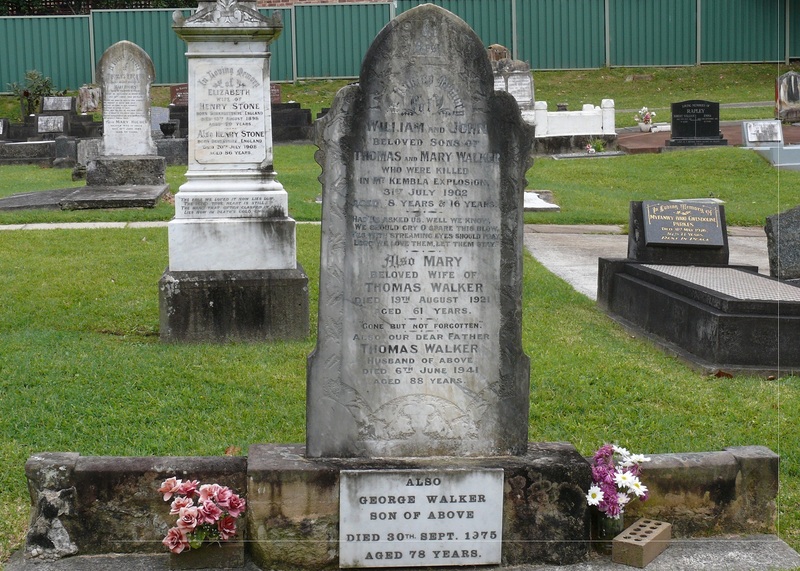 Note the year of 1898.
which has many grave plots where many victims of the 1902 Mt Kembla Mine Disaster are buried. Grave which includes two young brothers killed in the mine explosion plus other family members who died in the years following. Enlarge the photo to read the inscription. 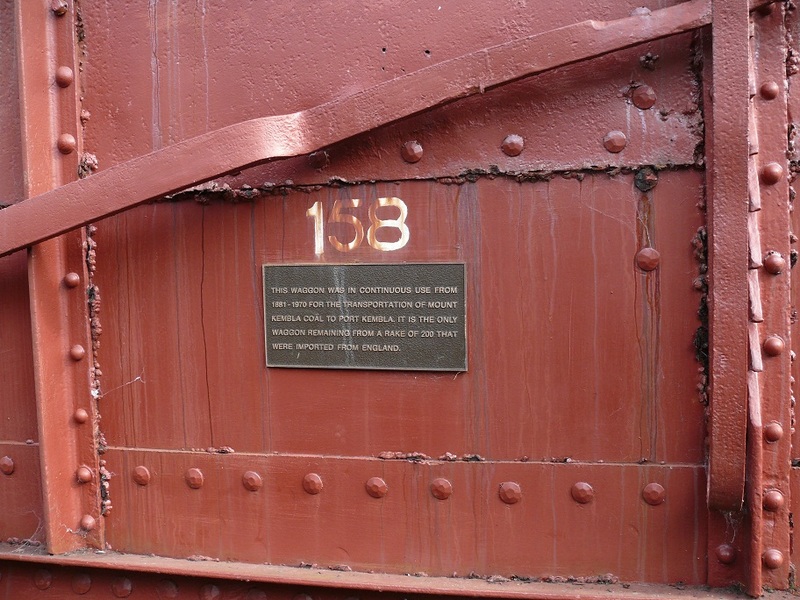 The original Mt Kembla Mine suffered an underground explosion on 31stJuly 1902 killing 94 men and boys, yes boys. A further two men died trying to rescue them. The rescuers were overcome with fumes. 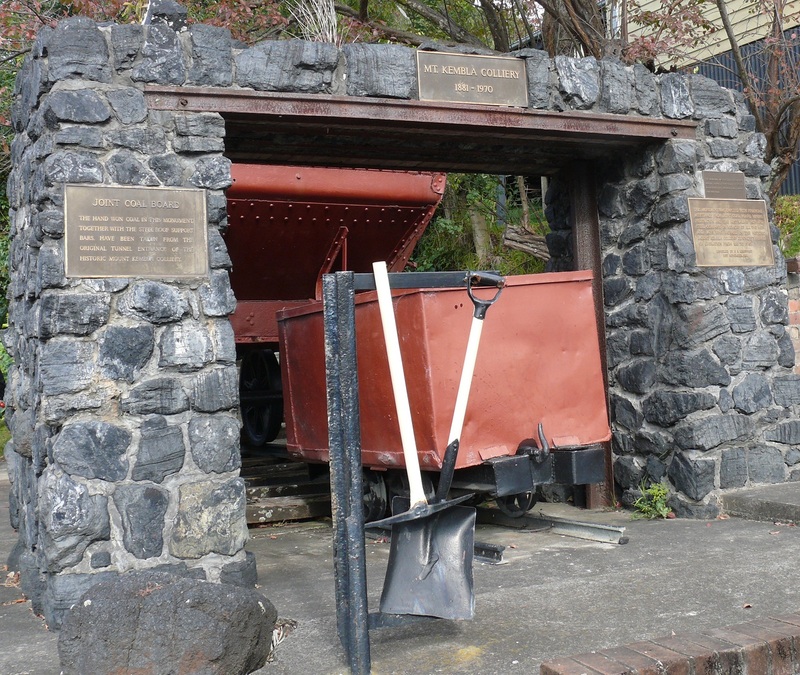 A recreation of the Mt Kembla Mine entrance including a coal skip and hand tools from the era. Enlarge the photo by clicking to read the inscription on the plaque. The mine was supposed to be free of mine gas but according to historians the explosion occurred when miners naked flame lights ignited coal gas which caused a secondary explosion of coal dust. Also on site are parts of the original entrance support beams, picks shovels, winches and some coal train bins recovered from the site. An original coal wagon from the Mt Kembla mine. Again, click on the image to read the inscription. The mine still operates today but safety and security are now primary concerns and operates under a different name. One sad story we noted while looking through the cemetery was that of a 17 year old killed in the mine. His grave and headstone were erected by his loving wife! Many of those killed were members of a family unit. Fathers and sons, brothers, uncles and cousins. Ummm. What did we do today? We just hung around the house in Corrimal. Errol went to work and we just spent time with Nicole n Amelia. Today was like a mirror image of yesterday only warmer. Today was different. Very much so. 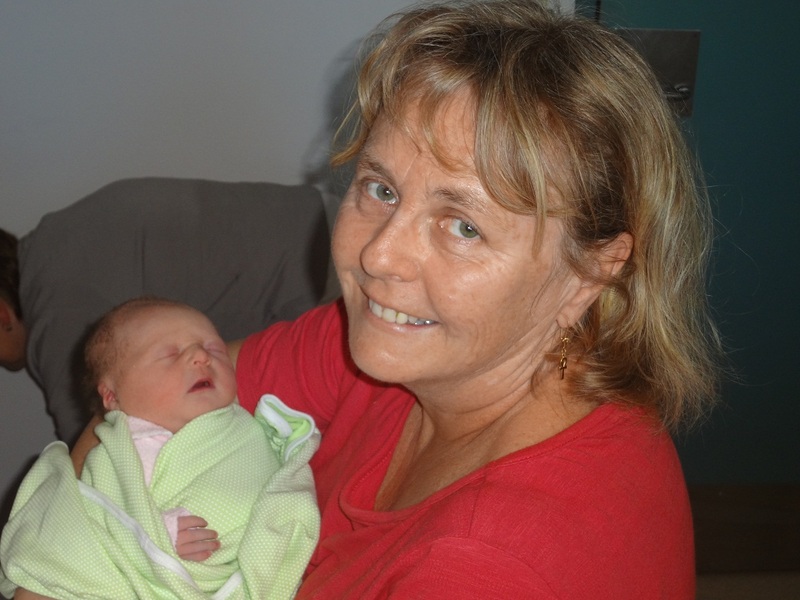 Merrilyn, Nicoles mum, was due to arrive and we were to move back to Sydney to stay with Bev n Pete. Nicole was not due to give birth for another 10 days or so. Errol woke us at 7am (yes. We slept in until 7am. Scandalous!) He was pointing a video camera at us and said he and Nicole were off to the hospital. Hmmm! Baby Hannah Joy was born at 12.23pm. 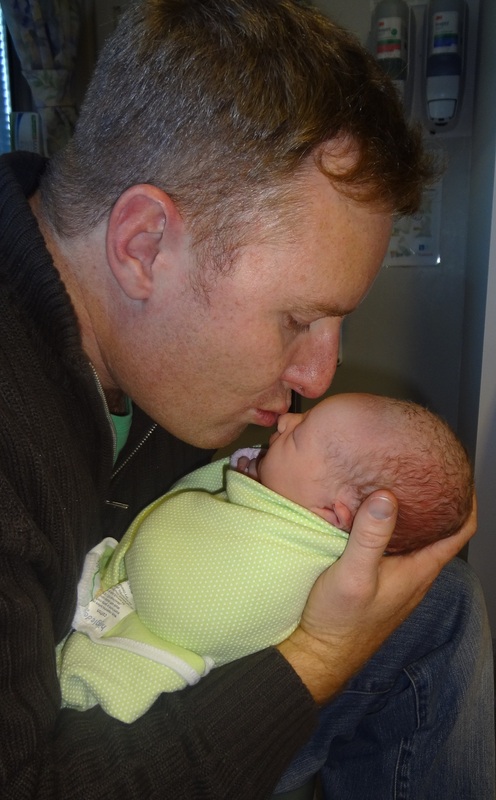 We went to the hospital to visit Nicole who was still in the birthing centre, not yet moved to the maternity ward. 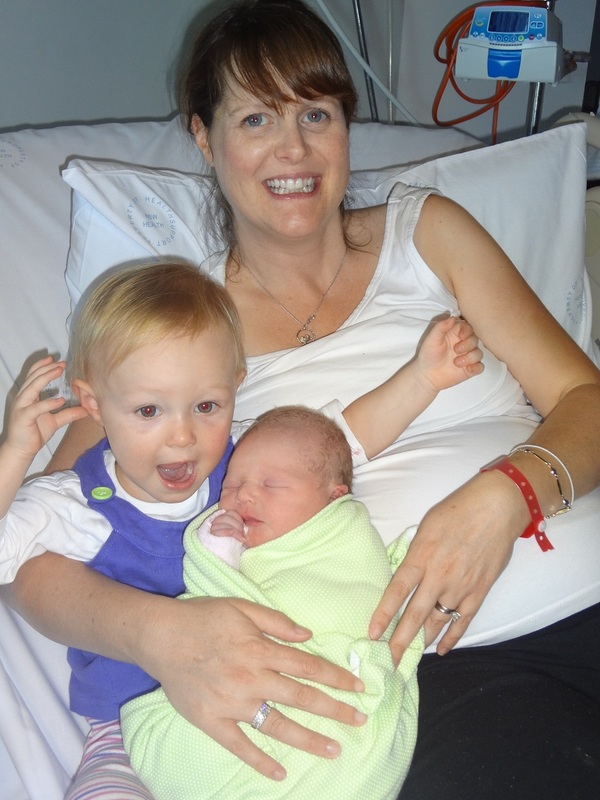 Amelia with little sister Hannah and mum Nicole. 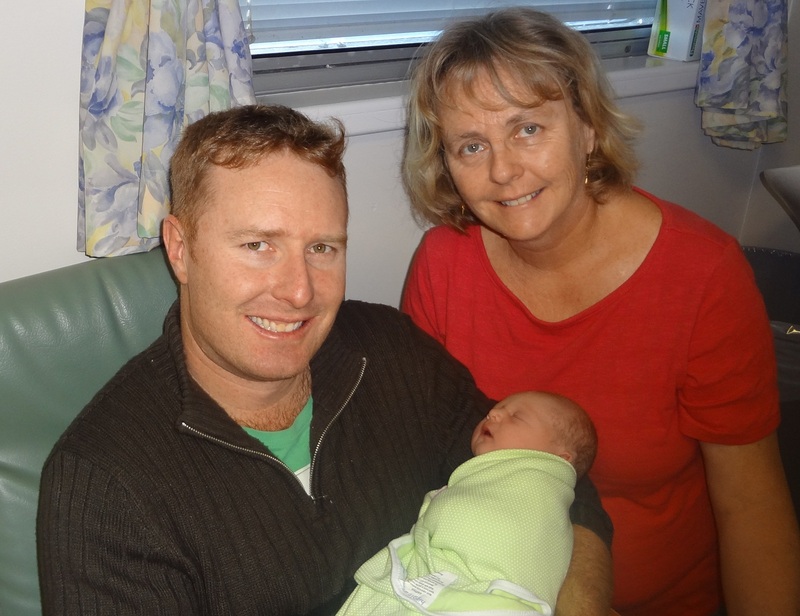 Proud Dad errol, proud Grandmother Donnis and Hannah. 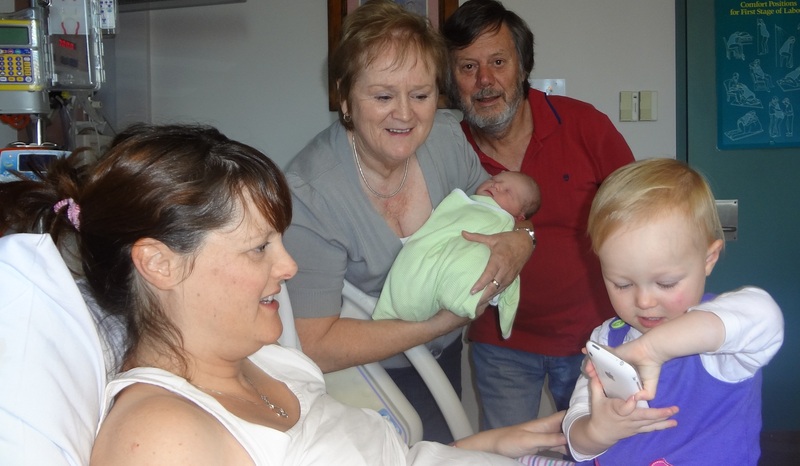 By now Merrilyn had arrived so it was quite a crowded room with Nicole, baby Hannah, toddler Amelia, Merrilyn, Errol, Donnis and myself with most of us gooing and gaaing, all talking at once and taking photos and all the stuff you do when in a hospital room with a newborn. Some of the crowd including Nicole, Merrilyn, Frank, baby Hannah and Amelia. About 20 minutes into the visit an official looking nurse came into the room to tell us we had to move. Leave? We asked. No. Move, was her reply. We need this room and Nicole is being moved to the maternity ward. So we all trooped along hallways and around corners and past all types of rooms with strange names printed on the doors until we arrived at Nicoles new room. Errol plants a loving kiss. Grandmother Donnis, Love is in the Air. Dinner was leftovers and Errol n I shared a few rum n cokes with neighbours who came over. Today was the warmest Autmn day in 70 years. Donnis spent much of the day looking for flowers to make into several arrangements. In the afternoon we visited Nicole and were surprised that meals are no longer brought to you. Instead you are given a meal “ticket”. Then when the meals arrive “down the hall” the patient must get out of bed and present her ticket down the hall for a meal. The meal is on a disposable plastic tray, complete with disposable cutlery, disposable drink container, disposable dessert cup and the complete package can be thrown away in a bin without any washing up. The meal looked about the worst type of meal I have ever seen or experienced in a hospital. Nicole ate the meal with the same amount of gusto you would expect with plastic food. Yuk! To the quality of food and Yuk to the disposable plastic profit oriented society we live in. Merrilyn stayed home and prepared dinner for us after which I packed TERIOS and drove back to Gymea. The CO-PILOT will stay at least another night in order to finish her flower arrangements and wait until Nicole arrives home from hospital before joining me. Last week I had a blood test and today I met with the doctor to discuss the findings. Bad Cholesterol, elevated but acceptable. Diabetes elevated and on the edge of concern. There are now tests which can determine more accurately the risks. I have scheduled a test for Monday. While at the surgery I also had a once only pneumonia injection, recommended for persons over the age of 65. The CO-PILOT arrived by train late in the afternoon. 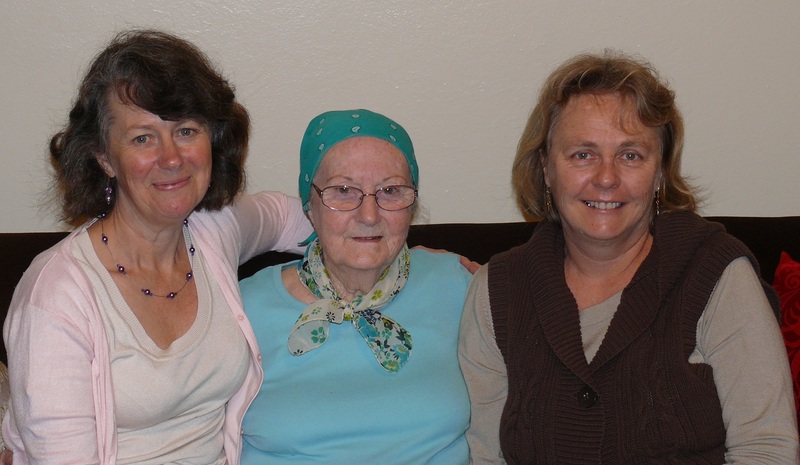 We drove through horrendous, creeping, braking, slow, miserable, narrow streets, Saturday morning traffic from Gymea to Redfern to visit our Aunt Gwen. Gwen is 89 and still tough as nails and a whizz on the computer, scanner and printer and makes jewellery. She was a very accomplished dancer and dance teacher up until only a few years ago. 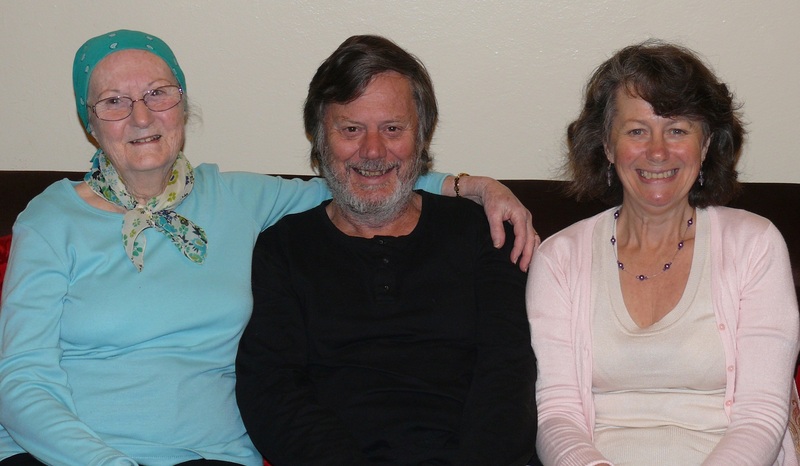 Gwen with Frank and Bev. If you have never been to Redfern there is not much going for it. I was not inclined to take photos. I was more interested in somehow hiding the camera and ensuring TERIOS was locked and no visible possessions. I was also warned to take the GPS with me or risk a smashed window. Redfern, after all, has a deserved reputation. Aunt Gwen has lived in this street since 1958 and has lived in the current one bedroom flat for 14 years. Security grilles are on all ground floor flats and entrance is by way of a security card or push a button to be buzzed into the foyer. Then more security screens and locks on steel doors. No. this is not a wealthy enclave. It was intended for retired persons on a pension . Now the Housing Commission moves drug addicts and other dubious characters in amongst the pensioners. Why? Because younger people will make more complaints. Pensioners are more likely to stay indoors with locks locked and not complain about strange goings on. instead and find the nearest fish n chip shop. I have not been to Coogee Beach for 40 or more years. My hankering for deep fried fish n chips has been satisfied for another 6 months. The fish was good but the chips were too oily. Yuk! 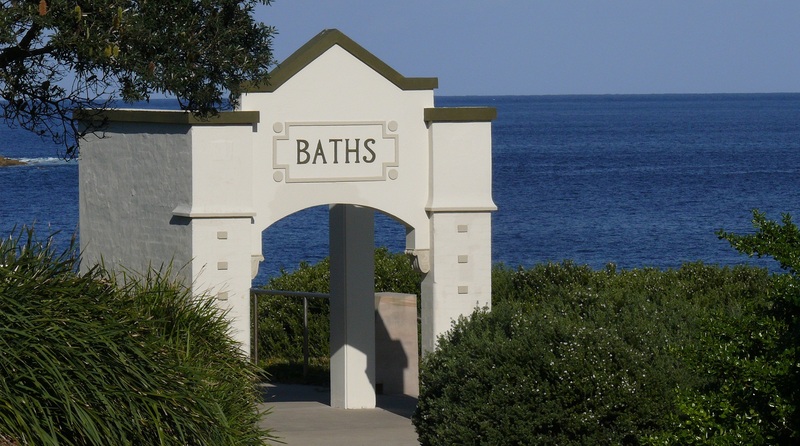 Here is the entry to the Coogee Beach Rock Pool. 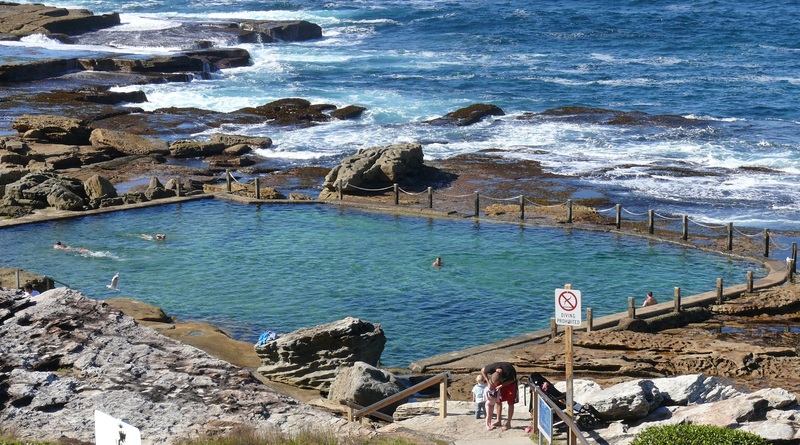 Typical of Sydney pools of this type, they are known as “BATHS”. An unusual feature of this rock bath is a natural formation has been enhanced with additional rock and cement. One end and part of one side are left open so the “bath” is continually washed clean by wave and tidal action. Another view of the rock baths. Inside the Baths entry is this tribute memorial to some of those killed in the Bali Bombing Saturday 12th October 2002. This is best viewed by double clicking the image. 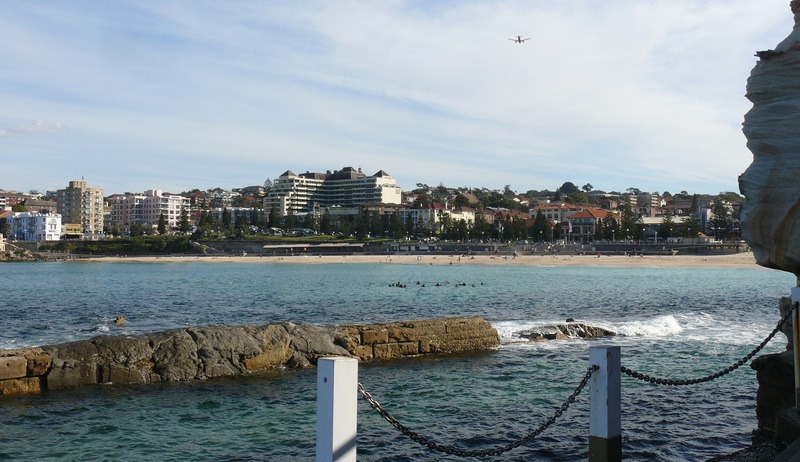 Coogee Beach is on the flight path to Mascot Airport. Most planes flew lower than this and seemed to be flying out of the hillside. 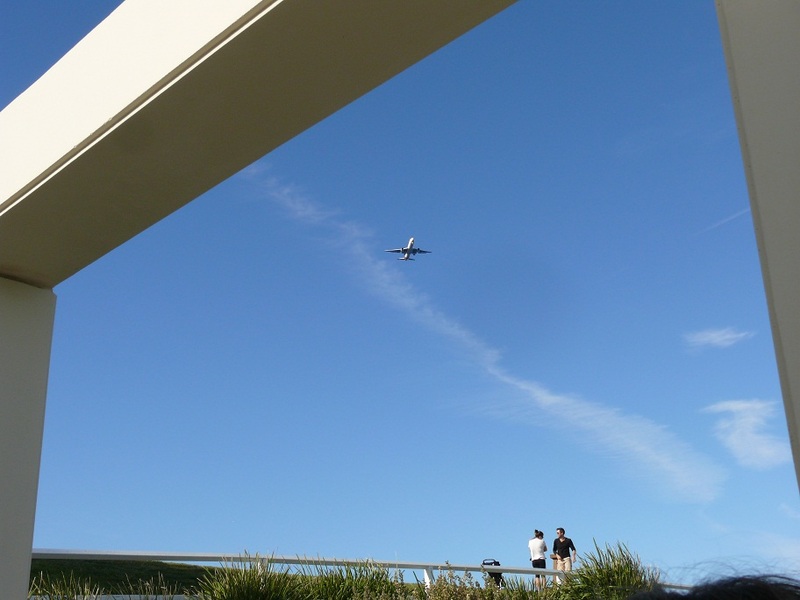 Planes flew over at approximately two minute intervals. If you ever go to Coogee Beach be aware that parking is fee payable. $1.20 for the first hour, money in slot, place ticket on dash. Parking police check at regular intervals…even on weekends. We arrived back at TERIOS ten minutes late and three parking police were making a sweep through the area. Sunday 13th May 2012. Mothers Day. The day started with brilliant sun shine but strong very cold south westerly winds buffeted the area all day. We drove to Corrimal to have a Mothers Day breakfast with Nicole, Merrilyn, Errol, toddler Amelia and baby Hannah. Without going into the reasons we finally drove to Shellharbour for a Mothers Day lunch at 3pm!!! When we left at 4.30 there were still people arriving for lunch! We drove back to Bev n Petes for dinner. Today was a lay day. We unpacked more stuff from WWWGO. We walked about 3klms to collect a new modem from the post office. I visited a doctor for an annual check-up. We drove to Miranda Fair Shopping Centre. When it was time to leave we could not find the exit to where we were parked on the roof. Hmmm! Note to self. No more short cuts when looking for the car in a huge shopping centre. Retrace your steps exactly as you came in. We drove to Corrimal to visit Nicole and Amelia. Errol was flying a plane to Canberra. The CO-PILOT and I both agree it is a pleasant drive along this section of the Princes Highway. The wilderness of the Illawarra Range with the tree and shrub covered hills marching off into the distance gives the feeling you are hundreds of Kms away from a city. Suddenly the road emerged beside the escarpment overlooking Wollongong city. Today we drove via the Bulli Pass, a steep and winding drive along the original track down the escarpment face. The Bulli Pass remained the only road to Wollongong for many years until the highway was built via Mount Ousley in the early 60’s. The Mt Ousley road opened up Wollongong and the south coast like never before. We drove back to Sydney after dinner. We took WWWGO to be repaired this morning. It involved a 38 Klm trip across the suburbs to North Rocks. We left just after what is supposedly “peak hour” and it took us a little over an hour. We elected not to hitch TERIOS, instead the CO-PILOT drove it, following in my wake. After months of planning we had expected to drop off WWWGO and they would start work that day or the next. Not so! We were informed they would inspect what work is to be done over the next few days, then call us with a quote. Only after the quote is accepted would they arrange a start date for the work!!! I was expecting, at worst, the work would take 10 days and we would have our “home” returned all spick n span and working by the 12th May. We may be lucky if work starts by 7th or 8th May. Grrr! That could interfere with other plans which I will talk about tomorrow. From the high cliffs at the north of Maroubra there are views across Lurline Bay to Coogee, Bronte, Tamarama and Bondi. Only Coogee Beach is clearly visible in the photo. and the Mahon Rock Pool. This is a composite photo with a 158 degree field of vision. Mahon Pool and the rocks at North Maroubra. 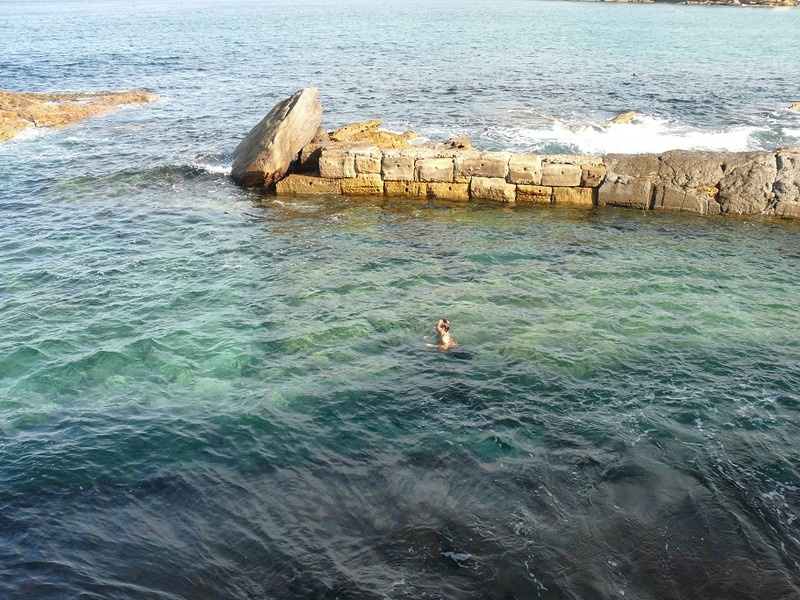 The very picturesque family friendly Mahon Rock Pool. The photo does not clearly show the sheer drop into the ocean. 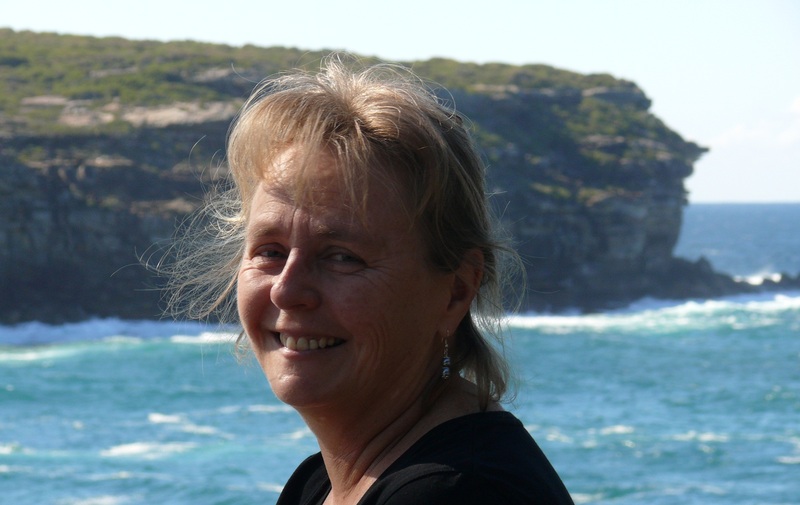 The blog, Red Nomad Oz often has photos of public toilets which she believes would take out the prize of most picturesque in Australia. Well Red, would this photo be a contender??? It is the public toilets at North Maroubra above the Mahon Rock Pool. Gee that sure brought back pleasant memories. Strangely as we drove along my old street, Donnis asked how I felt. I honestly felt claustrophobic as the narrow street, large blocks of flats and trees growing over the road all added to the feeling of crowding in on me. Later at the beach and on the rocks, with the salt laden wind blowing in my face and hair did I feel alive and open once more. All too soon it was time to head back to Gymea and do battle with the pre-peak hour traffic. 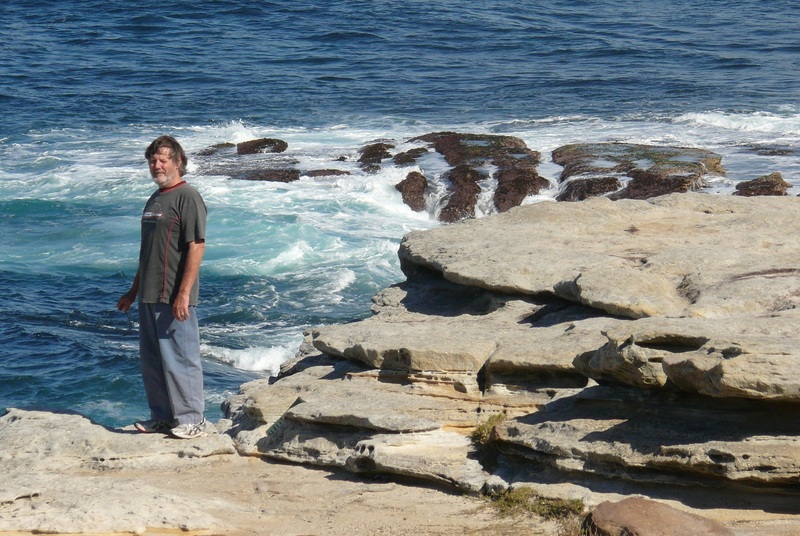 The attached photo shows a pill box on the rocky point at the south of Maroubra. You will need to double click on the photo to see the full size image. Double click on the photo and you will clearly see the “pill box” gun emplacement at Malabar Point. Malabar Battery was a coastal defence battery built in 1943 during World War II at Malabar Headland. The battery is also known as Boora Point Battery. The battery was constructed to complement the existing coastal defence batteries at nearby Henry Battery, Banks Battery and Bare Island Fort. Two 6 inch Mark XII guns in gun emplacements on mountings were constructed at the battery. An underground counter bombardment facility, with gun crew ready rooms, ammunition supply and engine room together with a narrow-gauge tramway which was cut into the sandstone and lined with sandstone and a large battery observation post were also constructed at the battery. The tramway was a single track of 560mm (22in) and was to transport the 6″ projectile munitions to the shell expense stores/magazines in the base of each gun emplacement. The tramway traverses through a deep continuous cutting lined with sandstone leads from the ammunition drop off point to the basement of the ammunition supply room and up to the two gun emplacements. Before reaching the gun emplacements, the line enters a rectangular section concrete tunnel which is 94m (310ft) long. Also constructed as part of the battery were northern and southern searchlight blockhouses with associated engine rooms and the battery barracks and toilet blocks. Following decommissioning of the gun emplacements after the war, the site fell into disrepair. More information about the gun emplacements along the coast and Sydney Harbour can be found here. 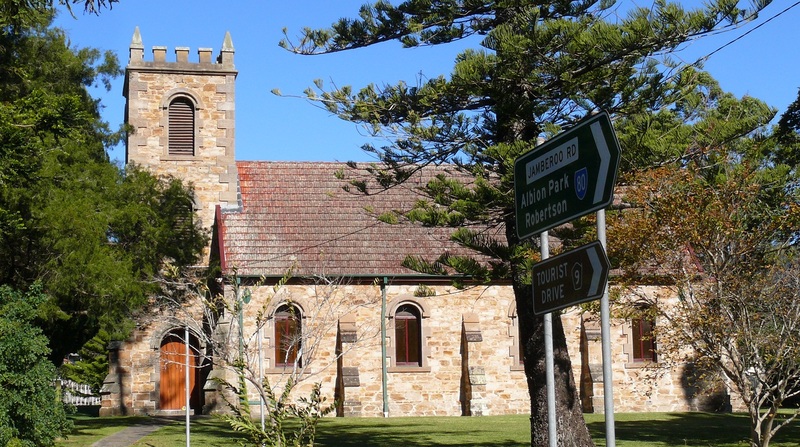 Today we drove back to Corrimal, near Wollongong. The CO-PILOT had anticipated Nicole will need lots of help over the next few days while Errol is at work. She packed food and clothes for the duration. I on the other hand thought we would only be gone for the day and overnight. Tonight we had dinner with Greg and Anne, a couple who are travelling for three months in their motorhome. We have agreed to a house sit and look after their two elderly dogs at their Horsely home (near Dapto a few Klms south of Wollongong) for the period. During the course of the dinner it was agreed we should aim for us to arrive on the 16th May so they can get an early start on 17th. Darn! WWWGO may not be ready in time and we may have to move into the house and arrange to collect our home afterwards. A sort of lazy day around the house in Corrimal, keeping toddler Amelia busy and taking some of the pressure off Nicole. We all drove to Windang to inspect a few villas which are for sale in an over 55’s resort. The views are spectacular looking across Lake Illawarra towards the Great Diving Range. Most of the villa’s have lake views. The property is an old caravan park site and is now being developed as an over 55’s resort. The problem is they cannot kick out the tenants who have paid to have their caravan on site for many years. The resort is a hodge podge mish mash of old and new, quality purpose built homes, some relocatable homes, some old park cabins and private old on-site vans. There seems to be no overall plan and old amenities blocks have been retained as club rooms but looking rather poor. The unheated pool was closed for the winter. Our first impression was of wonderful views but this was soon overridden by the piecemeal approach to building the resort. My mobile phone battery died during the day and the charger was still in Gymea. After lunch I drove to Gymea to get more clothes and a battery charger as well as spend an evening with Bev n Pete. Sunday 6th May… Edited 8th May. Somehow ALL the information for today has disappeared along with the photographs. This edit is a quick recollection. Drove back to Corrimal and after negotiating my way down the steep, winding and as testified by all the speed warning signs and concrete barriers, treacherous Bulli Pass. Accidents have happened here in the past and still happen despite the barriers. As I was driving down, following at a respectable distance from the car in front, both of us doing the posted speed limit, a car passed us both on the left hand side before breaking heavily for the next corner. The “P” plate in the car rear window explained everything. I call them temporary Australians. At the bottom of the pass I turned off the road to visit Sandon Point one of my favourite left hand surf breaks. Trig Point on the grassy clifftop at Sandon Point. Today the wind and swell were from a different direction creating a fast right hand break. Waves were a good metre and a half with an occassional larger wave breaking on the edge of the reef. I sat on the rocks for 15 minutes enjoying the surfers and recalling my days in the surf at this same location. 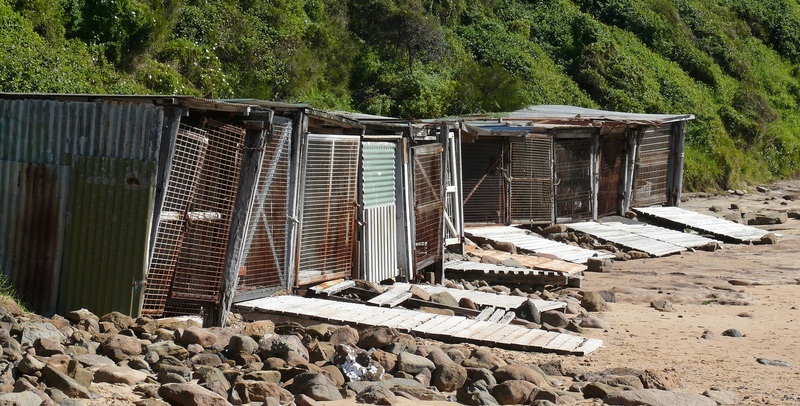 These fishing boat sheds have been in use since before my first visit here…50 years ago.